When Ferrus Manus awoke to find himself alone amidst the wilds of Medusa he, as one would expect from a child, was scared and confused. However, unlike a normal child, he was scared and confused because he assumed that he was there because he was weak. Unlike many of his brothers, Ferrus did not seek out human contact but instead set about testing himself against the very worst creators Medusa had to offer. Only once he had bested the Great Silver Wyrm, in the process encasing his arms in living metal, did he seek out humanity and set about teaching them engineering and other secrets of technology. At every turn he set out to assert his superiority. The living metal of his arms made him a warrior without equal and an artisan of extraordinary feats of engineering. Yet for all his efforts Ferrus Manus was never able to create anything of beauty and warmth. He ruled through fear of an unparalleled temper and his creations were cold functional things despite their sophisticated design. Even when the Emperor came to Medusa, Ferrus Manus challenged his authority. As Manus took his place amongst his brothers he suddenly found himself but one of a flock of luminous beings. Many far more luminous than he. Horus was charismatic, Guilliman wise, Vulkan compassionate, and Dorn an architect without peer. All he had achieved turned to ash and Manus resolved to push him and his newly named legion to the limits to prove their mettle and supreme worth to the Emperor. It was this crushing sense of inadequacy that would drive him to deliberately restrict the combat doctrine and units available to the Iron Hands to make them stronger, hardier warriors to prove that they were better than any other Legiones Astartes. He also allowed his sons to believe that flesh was weak, allowing a cult of personality to form around himself and his metal arms, the legion seeking to augment themselves at every turn. Unaugmented Legionaires were treated with mistrust within their ranks, it being seen as a slight against the Primarch. The sadistic truth of his actions wouldn’t be realised until after his passing in the Neimerel Scrolls in which he detailed his loathing for his metal arms and the horror with which he beheld the self-mutilation of his sons. The bitter and sad fact was that Manus’ loathing of flesh – particularly that of mortals – was actually the misdirected loathing of his contaminated body. But he remained silent because Manus was, for all intents and purposes, a psychopath. He was utterly self obsessed, born of a staggering sense of inadequacy and self loathing that led to fury and abuse towards his sons. Failure of ill news was met with tantrums and violence. The successes of his brothers only further fuelled his rage, pushing his sons even harder even at the cost of their lives. Questioning his orders lead to scorn and derision because deep down Manus didn’t trust his instincts. He only new explosive violence that came from fighting the malignant influence of the living metal of his arms. The only peace he could find, it seemed, was in the company of Fulgrim, the Primarch of the Emperor’s Children. On the surface this pairing seemed an unlikely one but Manus enjoyed Fulgrim’s beatific countenance and poets heart, it salved his tortured soul and helped him channel his energies in forging weapons of sublime beauty and devastating power. But even in these Manus took no pleasure beyond the weapon he crafted for Fulgrim. The hammer Fulgrim forged for him proved to be a psychological anchor for the troubled Primarch often wielding it as much to focus the humanity at his heart rather than channel the cold fury in his arms. The true tragedy is Ferrus Manus is that he was always on a path to destruction. The rivalry and resentment he haboured for his brothers pushed him to seek out the worst of the fighting. To conquer the unvanquished foe. To prove his worth above all others. It’s entirely possible that when he heard of Horus’ elevation to warmaster his isolation was sealed, every kindness and gesture of fraternity would be met with hostility and derision, hiding the abject sense of failure and irrelevance that lay at his core. As the years wore on Manus felt his control over the living metal of his arms slipping, pushing him further and further down a dark path that only Fulgrim or the crucible of war could salve. Manus was as doomed to an eternity of bloodshed as Angron unless he could win the battle of wills that he fought every single day against the constant and indelible symbol of his first and greatest failure. It remains to be seen if the Emperor was aware of Manus’ struggle. If he did he gave no indication which only further deepened his sense of isolation and his brothers mistook his profound and enduring depression as moodiness and ill cholor. When the betrayal came Manus led the merest fraction of his Legion to Istvaan, determined to see the treachery for himself. It was as much about disproving his worst fear – that Fulgrim had become corrupted. If a being as perfect as Fulgrim could fall from grace what hope did he have? This was coupled with the betrayal, not against the Emperor but against him. Fulgrim was the only soul in the galaxy that understood him and even liked him. That Fulgrim should turn from grace was unforgivable to Manus and had he been victorious and slain Fulgrim there’s every chance that the despair that would have taken hold of him would have pushed him into the embrace of the Dark Powers. 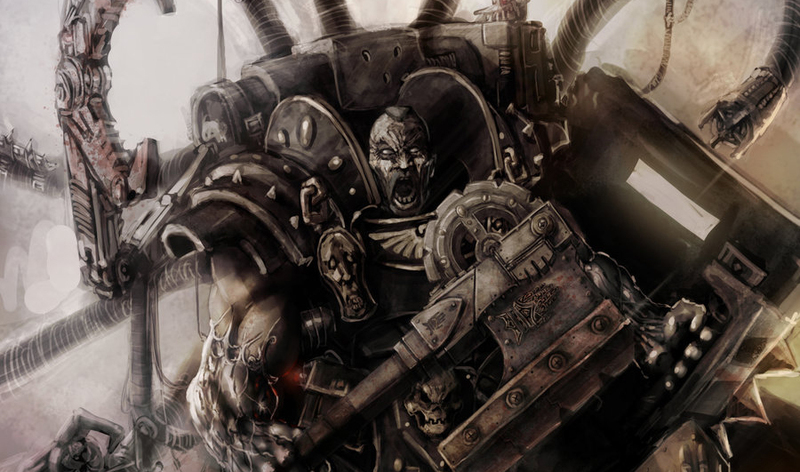 It seems that Ferrus Manus was the doomed of the Emperor’s sons. The moment he landed on Medusa he was set on a path that would see him dead at the hands of one of his brothers, it would have just been a question of whose banner that brother rallied to. But tragedy over tragedy is that his passing left his sons pursuing a goal that he abhorred. Their continual augmentation in his name would be the final cut in a tortured soul as he was little more than an abusive father, lost in the shadow cast by his kin, justifying his choices. And with his passing the cycle continues and the Iron Hands embrace ever deeper an ill conceived truth until one day none of their humanity will remain and the legion will cease to exist, and Manus’ failure will be complete.